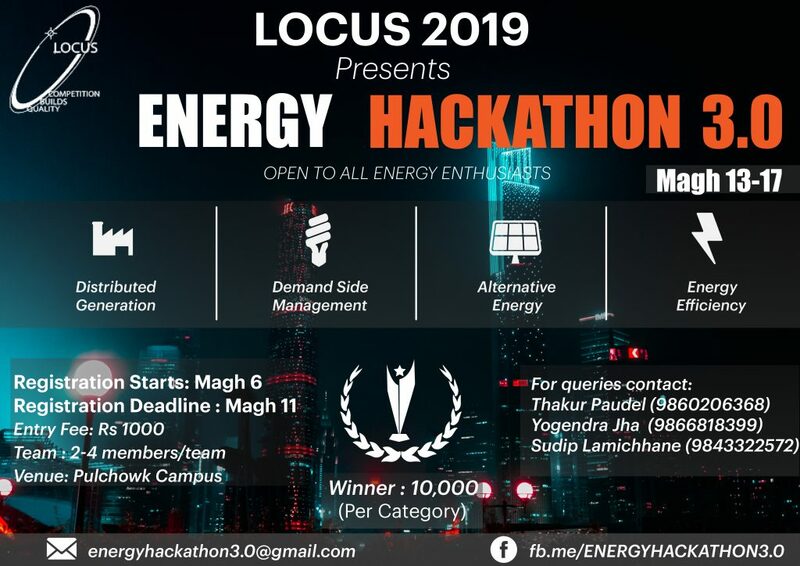 “Energy Hackathon” a complete platform for solving energy related challenges with a prime motto of distribution generation , demand size mangement , alternative energy, energy efficiency and aims to solve the energy problems of Nepal through collaborative efforts of students and amateur working in Energy sectors. The three things you need to participate in the event are: Idea, Knowledge and curiosity. The participants will be provided with food, drinks(soft only), internet and mentors during the event. The most common energy generation process till date involve large centralized generation stations at environmentally and technically viable areas which are usually far from areas with higher load concentration. Hence, the system is required to transfer the power over long distances through H.V transmission lines which involves large losses in the grid lines. Thus, the emerging concept of distributed generation and hybrid grids i.e. micro hydro, solar energy, wind energy, biogas, biomass is being adopted locally where the local generation, usually less than 10MW are generated in the local vicinity of the consumers and connected to the grid. This category is intended to emphasize on this concept of DGs and on how efficient implementation can be made possible in electrification of rural areas of the country. Nepal has recently been declared as a load shedding free area. This is an initiation made possible using peak load demand management. But there are challenges in meeting the local demand, especially during peak hours (evening and morning). This category is proposed to focus on peak hour load management and efficient load distribution. With the recent development in solar, wind, biogas and other forms of renewable energy generation, the alternative sources of energy have progressed as a good area for research and technological advancement and implementation around the globe. However, in context of Nepal, only a small proportion of alternative energy is being utilized. This area is intended to focus on such researches and technological developments that could be applicable in Nepal. Low energy efficiency is one of the major energy problems in Nepal. Energy losses during transmission, conversion and distribution significantly affect the quality of power. Also, various energy consuming units (loads) consume more energy than the output they yield due to uncontrolled reactive power demand. This area is supposed to focus on such contemporary issues of electrical energy efficiency of Nepal.